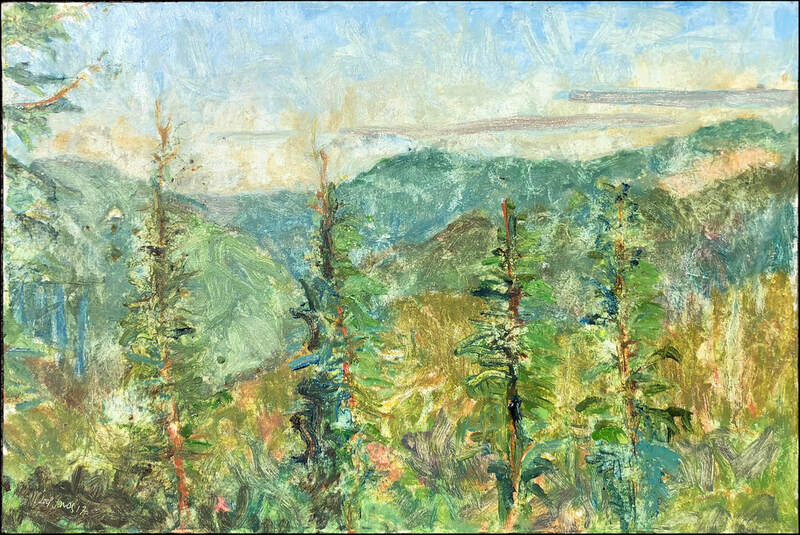 River House Gallery in Stevenson, Washington is featuring paintings by Ed Maitland Jones for the month of August 2018. There will be an opening reception with refreshments featuring live music by Ed Jones, Scott Sacharczyk and others. Ed Maitland Jones was born in 1962 in Portland, Oregon, and grew up enjoying the beauty of the majestic Columbia River Gorge. Ed’s earliest inspirations was an oil painting hanging in his grandfather’s kitchen of Native Americans spearfishing from platforms at the now-vanished Celilo Falls. Ed loved that painting and knew at that very young age that he wanted to be a painter. Ed’s sister, Suzy, taught him how to use paints and he painted all through school. When he graduated Ed went from one art form to another. He played bass and guitar semi-professionally for twenty years. In 2000 Ed enrolled in the Pacific Northwest College of Art and graduated in 2005 with a BFA in painting. He rented a studio and pursued his love of painting, holding fifteen exhibitions of his work during the following twelve years. River House Art Gallery is proud to present Ed’s first exhibition in five years. These paintings are all inspired by the Columbia River Gorge. An opening of the exhibition will be on Saturday, July 28 from 3:00 until 8:00 pm. Refreshments will be served, and at 6:00 Ed will perform a selection of his original music with bassist Scott Sacharczyk.